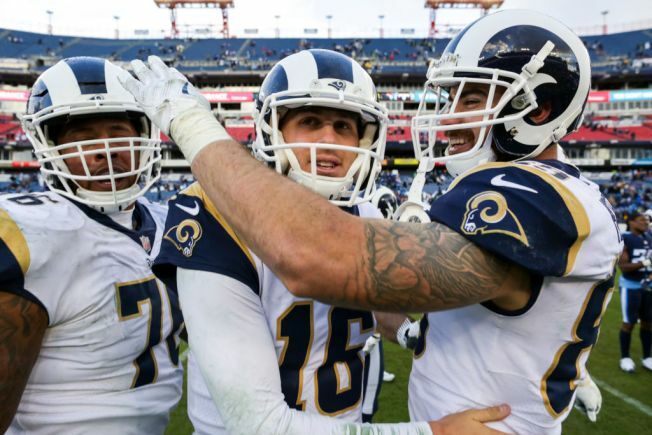 The Rams clinched the franchise's first NFC West title since 2003 by beating the Tennessee Titans 27-23 on Sunday. "When you find a way to come on the road and finish up your road record 7-1 and win a division title, there's only one thing you can say. Woooo! One more: Woooo!" McVay said before giving the Rams off until Wednesday. Los Angeles trailed 23-20 before Jared Goff threw a 14-yard touchdown pass to Cooper Kupp with 11:41 left. The Rams (11-4), who came in needing a win or a loss by Seattle to secure the division, took care of business themselves, with Todd Gurley II and Goff leading the way again. Gurley bolstered his argument for NFL MVP with 118 yards rushing and 158 yards receiving with two TDs, including a screen he took 80 yards for the longest reception of his career. He became only the third in NFL history to put together such a performance in the same game, joining Ollie Matson (1954) and Herschel Walker (1986). Goff finished with four touchdowns and 301 yards passing. "He is in my book," Goff said, vouching for Gurley for MVP. "If there's anyone out there that's a running back that deserves it, he's the guy." CONFIRMED: @TG3II is going to #HaveADay. Gurley finished the game with two receiving touchdowns, giving him 19 on the season, a new Rams franchise record. Gurley's 80-yard touchdown catch and run in the second quarter was the longest by a running back in franchise history, surpassing Marshall Faulk in 2000. The Titans (8-7) lost their third straight game, damaging their chances of ending their own playoff drought stretching to 2008. The loss handed the AFC South title to the Jaguars, and Tennessee hosts Jacksonville in the regular-season finale needing a win to reach the postseason. "We still have an opportunity to get into the playoffs, and that is the next objective," coach Mike Mularkey said. Head coach Sean McVay became the youngest head coach in NFL history to make the playoffs, and surpassed John Madden's record as the youngest head coach in the NFL to win their division. Madden was 34 years old when the Raiders won the AFC West in 1970. The Rams finished the season 7-1 on the road, and set a new franchise record for most points scored on the road in a single season with 250. The Titans' penchant for settling for field goals was costly once again. They had four trips inside the Rams 20 and scored only one offensive TD on DeMarco Murray's 6-yard run. Ryan Succop kicked three field goals and missed a 45-yarder wide right. Linebacker Wesley Woodyard scored Tennessee's first defensive TD of the season on a 4-yard fumble return. It looked as if the Rams benefited from a confusing sequence in the third quarter. After Murray scored on a 6-yard run, the Titans recovered an onside kick. Succop said the official signaled live ball, so he tried the onside kick to steal a possession. But officials threw a flag, and referee Walt Anderson announced the Rams took their first timeout just before kickoff. Then he announced there was no timeout because the ball had not been put in play. Then he said, "First down." The Titans kicked deep on the next try. Rams left guard Rodger Saffold hurt his ribs late in the game, and Rams safety Marqui Christian hurt a shoulder. Murray was helped to the sideline with 2:23 left with an injured right knee. Mularkey said Murray will have an MRI exam, but it doesn't look good. Rams: Host 49ers on Sunday. Titans: Host Jaguars on Sunday.